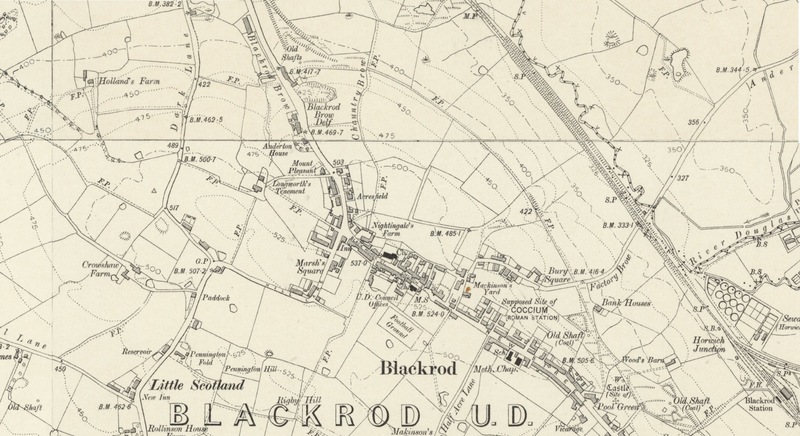 The Ainscough family origins in the 17th and 18th centuries are in the Lancashire village of Blackrod, and many members of the family were baptised, married and buried at St. Katherine's Church - which you can see in the centre of the map below. Click on this image to see a large-scale map of the Blackrod area. William Ainscough (1816) lived in various cottages in Canal Row at Red Rock in the 1840s and 1850s. Canal Row - labelled Middle Row and Top Row on the map below - lies at the end of a lane running up from Red Rock Lane (the modern B5239). Click on this image to see a large-scale map of the Red Rock area. 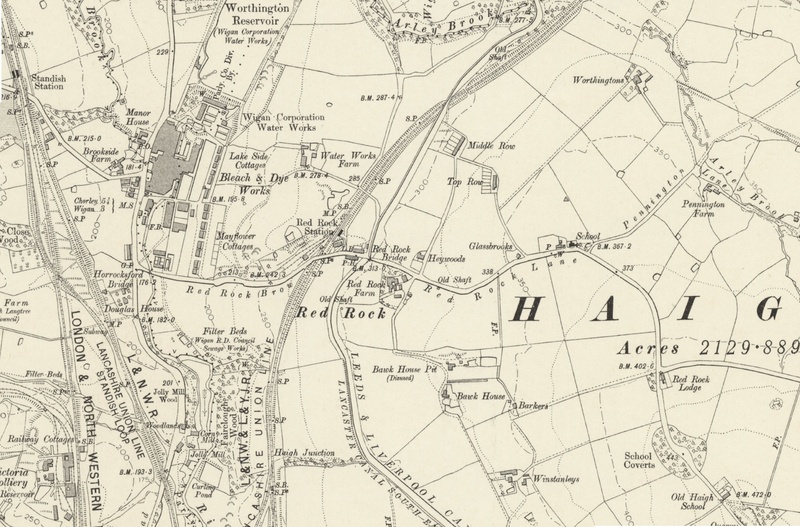 In the mid-19th century, the Ainscoughs lived in the Haigh and Aspull areas. George (1870) was born in Lindsay Terrace in Aspull. Click on this image to see a large-scale map of the Aspull area. Ralph Ainscough (1841) and family moved to Westhoughton in the 1870s. 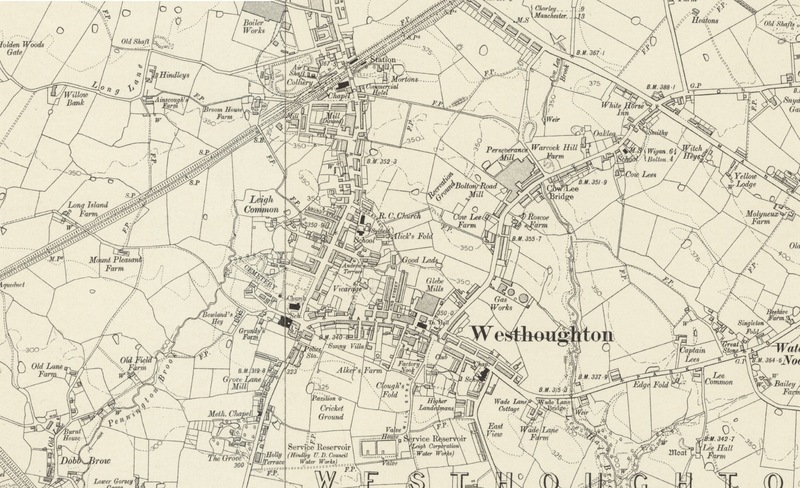 Click on this image to see a large-scale map of the Westhoughton area. George Ainscough (1870) moved to New Brunswick Street in Horwich in the late 1890s. His son Ralph (1899) married Alice Waite (1898) who had moved there with her family from Gorton, Manchester. Ralph became a fitter at the now long-gone Horwich Locomotive Works. 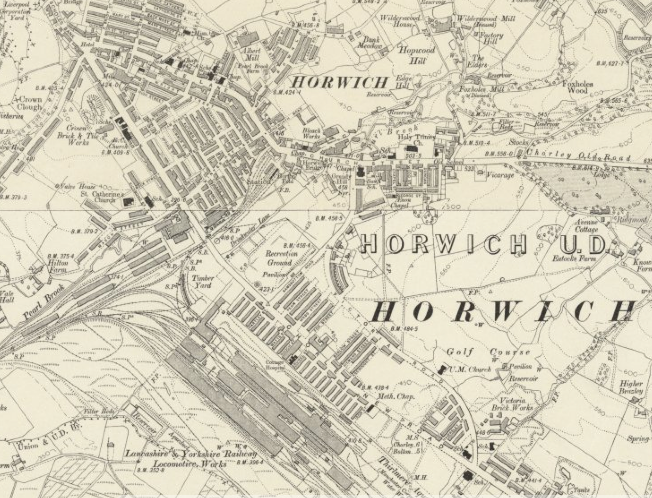 Click on this image to see a large-scale map of the Horwich area. The Bellingall family came to the Ancoats area of Manchester from Edinburgh in the late 18th century. At some point in the 1870s, the Boland daughters of Irish parentage arrived there from Worksop and Alice Boland (1859), the younger daughter, married John Waite (1860), the illegitimate son of Mary Ann Bellingall (1828). Click on this image to see a large-scale map of the Ancoats area of Manchester.